The Omron E5AC-T programmable temperature controller has up to 8 programs with 32 segments, totalling 256 program segments, that can be stored, either via Omron CX-Thermo PC software or the front panel interface. Its high contrast LCD screen which displays characters 25mm high ensures excellent visibility in all working environments. The three-level display is visible simultaneously so each process status can be easily identified. This model has 4 event inputs, which can used for program button, 1 control output for SSR and 4 auxiliary relay outputs, all in a compact 60mm (depth) 1/4 DIN controller size housing. Other models are also available within this range. 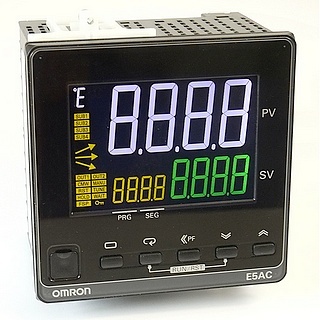 View more details of the Omron E5AC-T - 1/4 DIN Programmable Temperature Controller range. Other models might not be available from stock, please contact us for price and lead time.